South African Bianca Buitendag cut a swathe through the world’s best female surfers as she advanced to the Final of the Oi Rio Pro before finishing runner-up to Courtney Conlogue (USA) in one metre waves at Barra da Tijuca in Rio de Janeiro today (Sunday). Felipe Toledo (BRA) sent the partisan home fans into raptures of delight by convincingly defeating veteran Bede Durbidge (AUS) to capture the men’s title at the fourth stop on the 2015 Samsung Galaxy WSL Championship Tour (CT). After beating Alessa Quizon (HAW), Lakey Peterson (USA) and Sally Fitzgibbons (AUS) earlier in the event, Buitendag, 19, from Victoria Bay came into the final day facing a quarter-final rematch with Peterson. She dispatched the American to equal her event best result in Rio – third place in her Rookie season in 2013. Buitendag then went on to outpoint two-time World Champion Carissa Moore (HAW) in their Semifinal clash, leaving the current Jeep rankings leader requiring an excellent 8.03 for the heat victory, and qualifying for the second Final of her career. Conlogue got off to a fast start in the 35 minute finale, keeping the South African in a combination situation and needing to replace both her counting scores until just four minutes remained, and eventually triumphed by 14.50 to 11.10. The 8 000 points she earned moved Buitendag up two spots to No. 9 on the Jeep Leaderboard that is still dominated by Moore. Conlogue’s second successive victory saw her cement second spot on the rankings while Tyler Wright (AUS) is a distant third. Filipe Toledo (BRA) claimed the second CT victory of his career today following his inaugural win at the Quiksilver Pro Gold Coast at the start of this season. The 20 year-old from Ubatuba and continued his exceptional run of form with a win at the WSL Qualifying Series 10,000 event in Lower Trestles earlier this month. Previously at third place on the rankings, the result sees Toledo move up to second place on the Jeep Leaderboard behind Adriano de Souza (BRA). The blistering aerial manoeuvres of the young Brazilian in each Round of the competition kept the fans enthralled and Toledo was on top form throughout the event, winning each of his heats en route to Final with consistently high heat totals. Internationally rated women’s surfing returns to the shores of South Africa for the first time since 2008 with the announcement that the Ballito Women’s Pro presented by Billabong will be run at Willard Beach in KwaDukuza, just north of Durban, on Sunday 28 June. This QS1000 rated event offers prize-money totalling R30 000 along with priceless points on both the World Surf League (WSL) Qualifying Series (QS) rankings and the WSL Africa regional women’s rankings. First run in Durban back in 1992 when the event was known as the Gunston 500, the women’s event established a proud tradition over the next 17 years with former winners including World Champions Layne Beachley, fellow Australian Stephanie Gilmore and Sofia Mulanovich (Peru). Run once in Ballito, in 2008 when gigantic waves and inclement conditions forced the cancellation of the event with 32 women still in contention, South Africa’s top female surfers are ecstatic about the return of the Ballito Women’s Pro. The organisers and sponsors are also elated to be involved in making top-class women’s surfing available again for both the local competitors and spectators. Organisers are hoping that the country’s top international competitor Bianca Buitendag (Victoria Bay) will compete in the event. Buitendag, ranked No. 11 after the opening three events on the 2015 WSL Women’s Championship Tour (CT), is currently competing in the Oi Rio Women’s Pro in Brazil. Willard Beach will also host the Ballito Pro Trials presented by Billabong on Sunday 28 June, giving up to 32 men the chance to clinch the two coveted trials slots in the elite 96-man field who will contest the Ballito Pro presented by Billabong that starts the next day and runs until Sunday 5 July. The field for the trials is made up of the next 16 highest placed surfers on the QS rankings who missed the cut for the 94 competitors in the R3 million, QS10000 main event. These 16 will be joined by the 12 highest ranked WSL Africa members plus two Billabong wildcards and two surfers to be selected by Surfing South Africa (SSA). extreme sports programme, the Coastal Living Bru Food & Wine Festival and an exciting retail area while 5FM brings some of South Africa’s most talented music acts to the stage. Durbanite Grant ‘Twiggy’ Baker placed fifth in the Quiksilver Ceremonial Big Wave Invitational which was won by Makuakai Rothman (HAW) in huge 10 – 13 metre (30 – 40 foot) waves at Punta De Lobos in Peru on Friday. The 24-man field was given the green light for the event to run on Thursday but the predicted swell did not materialise until late in the day. Organisers eventually got the event underway in 5 to 8 metre waves at 3pm and completed all four Round 1 heats before dark. Baker, the 2013 World Big Wave Champion, was in the first heat of the day and won the six-man clash convincingly. He recorded scores of 8.83 and 8.33 (both out of 10) on his two counting rides for a heat total of 25.99 points (out of 30) as the highest single score for each competitor is doubled in value. Capetonian Frank Solomon, who had only arrived at the contest site at 4am that morning after his surfboards were lost in transit, just failed to advance to the semis when he finished in fourth place behind Baker, local and defending event champion Marcos Monteiro (CHL) and Koa Rothman (HAW). The swell filled in overnight and the semi-finalists were greeted by enormous walls of water peeling down the left-breaking point at first light on Friday. Baker again dominated his encounter, posting rides of 8.83 and 6.57 to finish five points ahead of eventual event runner-up Cristian Merello (CHL) and eight ahead of event winner Rothman. 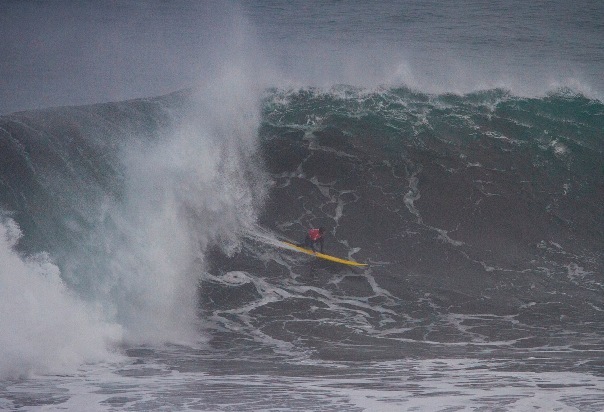 In the second semi, local standout Ramon Navarro rode what was considered the biggest wave of the day, a massive 15 metre mountain of water that earned the Chilean a near perfect score of 9.70. The final belonged to Rothman who rode a total of six waves including a pair of eight pointers. Baker was only in position to ride two waves and finished behind Merello, Navarro and American Nic Lamb. Australian Mark Mathews was sixth. The Quiksilver Ceremonial Big Wave Invitational was the first event on the 2015 / 2016 World Surf League (WSL) Big Wave Tour (BWT). Two more events in Peru and Mexico are scheduled for the period May 15 to October 31. Those are followed by four events in Oregon, Baja California, Maui and the Basque country during the period October 15 to February 28, 2016 before the 2015/16 world champion big wave surfer will be crowned.